Kleen King has been helping business owners and homeowners in Central Montana with their cleaning jobs for 32 years. Kleen King Technicians go to training classes and seminars continuously to keep up with the many changes in the Cleaning and Restoration industry. It enables Kleen King to continue to provide the Best and Latest technology for their clients. Kleen King carries top-of-the-line equipment and Truck Mounted Systems that give your carpet a Deeper Clean. Nothing cleans a carpet better. Your carpet is finished with a final rinse, so no residue is left in the carpet. And DuPont Teflon Stain Shield is applied to Residential Carpets and Upholstery, at NO EXTRA CHARGE! Good manners. Got rid of spots on carpet. James and Brad were excellent! They were very courteous and friendly. I was in a pinch and I appreciate the great service! Paul was very professional. He did a great job! "They made a point of telling me what other services they offer. EVERY team should do the same thing!" "I ended up with unexpected handymen on-site at the same time and Paul did a great job working around them. " Paul was awesome and did a great job! If all your employees are as professional as Paul, then I know who I'll be calling next time. "Loved that you were willing to come back to get the stains out!" "Outstanding work! I used another company that was ok, but this time was just GREAT! " Kleen King is here for any carpet cleaning you need done in the house. We use hot water extraction, considered the best deep carpet cleaning method to ensure that your carpet is clean to the roots and not just the surface later. We are an IICRC-, RIA-, and CRI-certified firm. Whether this be the whole house or a small stain removal we are ready to take on the job and solve your problem. Area rugs can benefit from a deep cleaning. Kleen King excels at in-plant area rug cleaning with our specialized cleaning process. Pick-up and delivery is available. IICRC-, RIA-, and CRI-certified firm with a commitment to up to date with the latest in technological advances in cleaning and restoration. Our fleet of truck mounted and portable equipment can handle any commercial cleaning job in Central Montana. We can develop schedules that best fit your needs and budgets as well as suggest low-cost proactive solutions to make your carpeting and furniture last longer. Kleen King offers janitorial services for Montana businesses that range from medical offices and retail stores to restaurants and casinos. We only employ the most capable, responsible, reliable personnel. We are your source for professional office cleaning services. Properly cleaning HVAC systems requires removing the sources of contamination. Source removal begins with use of one or more agitation devices designed to loosen contaminants from the surfaces within the heating system. During cleaning, the entire HVAC system is placed under continuous negative pressure (vacuum) to prevent the spread of contaminants. Continuous negative pressure allows very fine particles to be removed from the system as they become airborne, ensuring they are not released into the living space when the system is turned on after cleaning. Kleen King specializes in the cleaning of tile and grout in residential and commercial locations. Call today for a Free Estimate. Kleen King can handle any cleaning job from small to large. Cleaning services include walls and ceilings and everything in between. We also offer post-construction cleaning and housekeeping services. Call today and our operators will be happy to assist your needs. The use of proper window cleaning tools ensures sparkling results. Kleen King can provide interior and exterior window cleaning. We also offer pressure washing services to both residential and commercial clients. Water damage happens fast. It may start with a small leak but turn into a major disaster overnight. A timely response to water intrusion significantly limits costly damage and reduces health concerns. The longer the exposure, the greater the damage. A minor water claim can become as costly as a major water damage claim if left unaddressed. A fire can severely damage the structure of a home or business as well as any contents. Kleen King technicians are IICRC-certified in the proper cleaning and handling of all fire and smoke related items. Kleen King is licensed as a general contractor and can handle any repairs necessary with care and professionalism. Eliminate your mold problem today. The first step is to fix any water-related problems as soon as possible. If any mold is present, it's time to call in the experts. Kleen King works with certified mold inspectors to ensure that your home or business receives the proper treatment. Call today and we will be happy to answer any questions you may have. Kleen King provides carpet cleaning services such as residential and commercial carpet cleaning, upholstery cleaning, office and janitorial cleaning, as well as air duct cleaning, tile & grout cleaning, and water removal services. 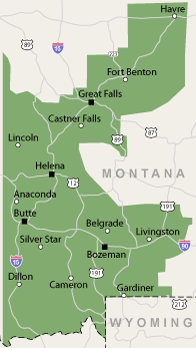 We provide these services throughout Montana, including Bozeman, Great Falls, Helena, Butte, Havre, Livingston, Belgrade, Anaconda, Deer Lodge, East Helena, Clancy, Manhattan, Townsend, Whitehall, Three Forks, Box Elder, Ennis and the surrounding areas.